As Rom lies dying in Starshine’s arms, she screams out her frustration at the world and the unfairness of it all. And while Russian soldiers attack, there remains a bit of hope as Rom is simply dying and not yet dead. So back into the cave they go where they find Quasimodo’s machine and someone to help run it in the form of the Gremlin. All it will take is a little quid pro quo on Starshine’s part and Rom will be revived. Obviously there is no question on her part. This issue was quite moving and the regular team of Bill Mantlo and Sal Buscema did a great job of bringing that heartbreak across to the reader, before and after Rom regained his body. 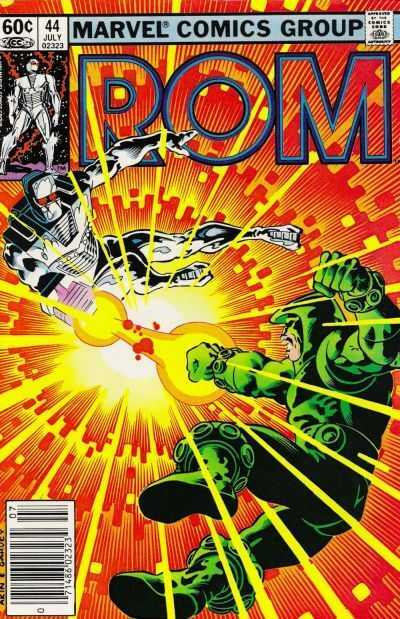 The book started out on a pretty sad moment and that never actually lets up throughout the whole issue even though it is soon packed with action and excitement as Rom and Starshine battle the Russians and the armored men at their command. For even though Rom is restored to his Spaceknight armour, the human body he used to inhabit is still alive and still retains his brain patterns. So for all intents and purposes, even though Rom will live, we still get to see him die and it is a little tragic to say the least. Not only did Rom ‘die’ but so did his hopes of ever becoming human. The only upside to any of it is the fact that he finally gets to be with the woman he loves. Maybe not in the way he thought he would nor in the way he wanted to, but it is better than nothing. This is definitely one of the best issues of the series to date.